As America’s most European city, New Orleans is best known as the birthplace of jazz, a culinary mecca of the world, and its Laissez Les Bon Temps Rouler attitude! It is a little different here, this is what you can expect when bringing a group to New Orleans. But look a little closer and you will see that New Orleans’ classical ambiance is also married with vibrant art, southern cuisine and cultural influences spanning the globe making it like no other destination! Traditions are deep rooted and passed on from generation to generation. New Orleans is the most “walkable” city in the U.S. as our downtown area spans only a six mile radius. We never give directions using traditional north, south, east, west markers. Instead, we refer to banks of the Mississippi River (East and West), Lake Ponchartrain (Northshore and Southshore), Uptown, Downtown, etc. Although our geographic square footage is small compared to other cities of comparable population, there are 73 official neighborhoods. We also had Wards that came out of the 1912 reconfiguration like the 9th Ward supported by Brad Pitt with his “Make it Right” Foundation following its devastation. Whether it is the French Quarter, Warehouse District, Garden District, Mid City, Marigny, 9th Ward, and the list goes on…….each neighborhood contributes to our culture in different ways mostly due to ethnic settlement patterns like the Creole Quarters or “French Quarter” as we call it today and the American Sector. Named the “No. 1 Destination to Visit in the World in 2018” by the New York Times, our culture is the fabric for what makes us so unique and it’s been in the making for the last 300 years. This video explains it best. New Orleans is 300 years enriched in traditions that cross all borders of the world. Recipes are passed down from our migrant relatives and served in restaurants throughout the city. Named the “No. 1 Food City in the South” by Southern Living, we want to share those secrets with you and plan your guests’ meals in one of our world-renowned restaurants like the one in this video. Expect us to hug you the first time we meet you. In our world, it’s the same as a handshake, but it is genuine. In our authentic way, we hug everybody! We’re not making a pass at you, but instead we’re welcoming you with open arms and letting you know how happy we are to meet you. We move groups a little differently in our city. Since we parade when someone is hatched, matched or dispatched or just for fun, we want your guests to experience that second line parade too! It’s best understood by watching how much fun your guests will have in this video. Hospitality is embedded in our DNA. Over 11 million visitors thought we did something right last year, so we’re not going to change our culture. We’re going to run with it! Don’t miss out. 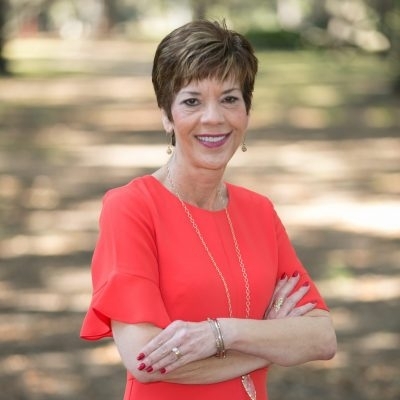 Connect with me at cindy.hayes@alliedpra.com, and our team will guide you each step of the way to create a lifetime-memory of New Orleans for your guests! For a sample of services or to learn more about us, visit us www.nolameetings.com.